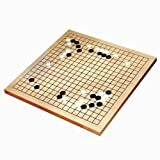 Go is perhaps the oldest strategic board game in the world. People have been playing Go for thousands of years already. Playing Go helps you improve and retain memory, concentration and self control. 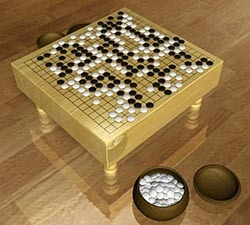 Scientists have found that playing Go uses both sides of the brain. This means that Go activates both the creative and logical parts of the brain and allows players to strengthen connections between the two. It's an ideal hobby to train your for brain, but it's so fun. The rules are very simple but the game play can be very intriguing and challenging. Learning to play is easy, new players can learn the rules in about 5 or 10 minutes. Learning to play good is something else. This requires a lot of study and practice because each game is different and can lead to a countless number of patterns and clever maneuvers or tactics are needed to win against good players. 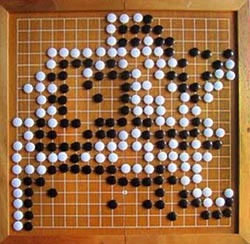 A standard Go board has 19 lines drawn on it in both directions. But there are also smaller boards available (5x5, 9x9, 13x13 and 19x19 are most popular). The best way to learn, especially at the beginning, is simply to play games on small boards (5x5 or 9x9) and become familiar with the patterns. 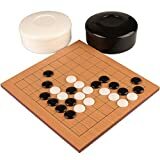 The pieces (units) in Go are called stones and are colored black and white. Black always opens the game and after that the players alternates to place stones on the board. The purpose of the game is to try to surround area on the board. The area you control is called "territory" and the player who has to biggest territory on the end wins the game. That sounds too easy, but things become more complex because you can also capture your opponents stones when you surround them. But be careful, your opponent probably plans a counter against you and you have to watch your back and front. The concept of balance is essential in Go strategy. Compared to many other games (like Chess or Checkers), the object is to create rather than to destroy. An early mistake can be made up or reversed as the game progresses. The game rewards patience and balance over aggression and greed. Strong players must be flexible and be prepared for anything as the power may shift multiple times during a game. 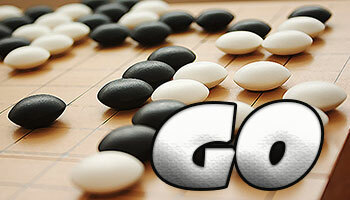 In China, Go is known as "Weiqi", in Japan they call it "Igo" and in Korea it is named "Baduk". The international name "Go" comes from the Japanase word "Igo" (which means "surrounding board game"), because it was Japan who introduced the game to the Western world. Nowadays there are millions of Go enthusiasts in Asia and throughout the world. Top players participate in professional leagues, and championship matches draw large television audiences. With the creation of the internet, amateurs from all over the world can now meet each other for games while in their own homes and watch professional players compete. The game appeals to many different people: to artists, to mathematicians, to entrepreneurs, to athletes, etc... Children learn the game readily and can reach high levels of mastery. Each level of play has it charms, rewards and discoveries because a reliable system of handicapping brings players into range for an equal contest.